Trainer Julie Blacklow thought Q’s quiet demeanor and willing attitude had to do with her team’s excellent training skills at Rosebud River Ranch in Snoqualmie, Wash. In reality, the yearling Rocky Mounted Saddle Horse gelding was critically sick with proliferative enteropathy, a diseased caused by the bacterium Lawsonia intracellularis and something Blacklow, a veteran horsewoman, had never heard of. The American College of Veterinary Internal Medicine (ACVIM) is trying to change that by making owners more aware of L. intracellularis in horses. At the 2013 ACVIM Forum in Seattle, the organization introduced Q as part of its “Animal Survivor” program, which highlights animals that—thanks to advances in veterinary internal medicine—have lived through severe disease. Q’s survival story started when he spiked a temperature of 104°F (99-101°F is normal). He also became lethargic and stopped eating, a sign to Blacklow that something was very wrong with the young horse. After an inconclusive initial exam by a general practitioner, Blacklow sought a specialist’s second opinion. She contacted Chantal Rothschild, DVM, Dipl. ACVIM, of Northwest Equine Veterinary Associates in Maple Valley, Wash.
Rothschild performed ultrasounds of Q’s chest and abdomen looking for the source of the infection causing his fever. Then the gelding’s blood work came back with extremely low protein levels. This is a telltale clinical sign of proliferative enteropathy, a spreading infection of the intestine most common in foals two to seven months old that renders the animal unable to absorb protein from the diet. 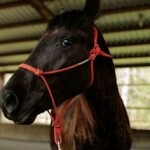 Edema (swelling) had also developed around the horse’s jaw and down into his chest. L. interacellularis is common in pigs, and certain wild animals are thought to carry it, Rothschild said, adding that the disease is believed to be contracted when horses ingest bacteria from infected animal feces. Rothschild had treated equine cases during her time practicing in Texas and at Washington State University on the eastern edge of the state. “But I’d never seen a case in the Seattle area,” she said. “I was like, ‘Yay! That’s what we want!’” Rothschild said. 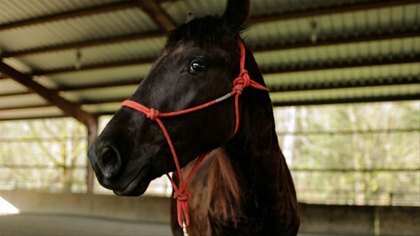 Q’s intensive treatment continued for six weeks, multiple times per day, and required dedication from the farm’s workers and the horse’s patience. Q was an excellent patient, Blacklow reported, and has since made what she considers a full recovery. In addition to Q, the ACVIM named four dogs with diseases ranging from cancer to neurologic conditions as Animal Survivors. For more information visit www.WeAreAnimalSurvivors.org. This entry was posted on Wednesday, June 19th, 2013 at 7:52 pm	and is filed under Healthy Pets, Horses, Medical Issues. You can follow any responses to this entry through the RSS 2.0 feed. You can leave a response, or trackback from your own site.